Mrs. Laura Francis Littlefield Nichols, loving and faithful wife and mother passed away August 27, 2018 at the age of 97 at RiverMead Life Care in Peterborough, NH. She was born March 18, 1921 in Auburn, ME, daughter of Phillip H. and Louise Hall Littlefield. She is survived by her loving husband John Robert Nichols Jr. who continues to live at RiverMead. She was pre-deceased by a sister Helen Roehrig and brother Fred Littlefield. Laura and John raised 4 daughters, Holly Raymond (deceased January 2018), Marcia Margiotta (deceased January 2007), Ann Durand who lives in Eagle, Idaho, and Alice McLane who lives in Jackson, NH with her husband Alan. She is also survived by 6 grandchildren and their spouses: Kevin & Gail Mocklin, Julie & Noah Lawrence, John & Leanne Ballou, Jannica & Julian Paraschiv, Laura & Scott Bennett, and Carrie & Matthew Burkett, and 10 great grandchildren: Matthew & Joshua Mocklin, Kristen Morrill, Kara Ballou, Elias & Simon Lawrence, Willow & Idolyn Bennett, and Isabelle & Vivien Paraschiv. After high school, Laura attended Portland Jr. College. She married John and they started their family in Springfield, VT and later settled in Lexington, MA where they enjoyed many good years and made many friends. They spent their retirement years in Wolfeboro, NH and later RiverMead Life Care in Peterborough, NH. Laura was artistic and hard-working. 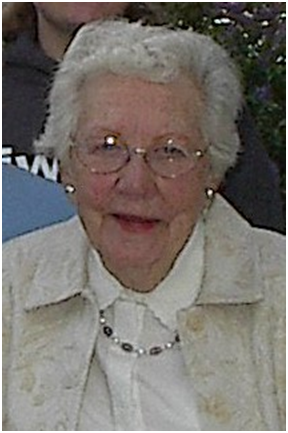 She volunteered with many organizations throughout her life. She also designed and created many beautiful gardens, became a certified landscape designer, and later excelled at watercolor and oil painting. She loved researching stocks and market-trading as much as she loved her kitty at home! A memorial service will be held at RiverMead, in the auditorium, on September 8, 2018 at 2:00 PM with a reception in the Courtyard to follow. Her ashes will be placed in their family memorial at Mount Auburn Cemetery in Cambridge, MA.